The broad stock market is up over 220% since its 2009 low. This is a bloated run for a wide basket of stocks in just 8 years. It is also one of the longest bull runs in history. These facts tell us the stock market is overvalued and that now is NOT the time to buy general equities. And as Mike pointed out in last week’s video, a mandated stock market crash is coming. Government bonds are even worse. They’ve been in a bull market for over 35 years. Not only are bond yields terrible money-making investments, the safety they usually carry is in jeopardy. That’s because bond prices will FALL when yields begin to rise, meaning bonds could lose value. Bond prices clearly do NOT represent buying low. They’re way overvalued, and after a 35-year run will sooner or later suffer a catastrophic decline. It will be devastating for many investors. The global bond bubble dwarfs anything in history. When the bubble bursts, it will be bigger than the stock market crash. Investors that buy bonds now are obviously buying high. The average US house price just surpassed the 2006 peak, one of the biggest real estate bubbles in history. And this recent run-up occurred in just five years. What’s scary about this bubble is that a big chunk of it is the result of institutional buying… as a group, they’ve purchased almost one-third of all foreclosed homes since 2009. Once real estate begins to crash again, they could quickly dump them. At a minimum, that source of demand will dry up. It’s clear that now is NOT the time to buy real estate, either. You’d be buying at or near the top of another bubble. In spite of their recent uptick in prices, gold is roughly 35% below its 2011 peak, and silver 62% below. The undervaluation is greater for silver than gold: despite all the inflation that has occurred since 1980, the silver price remains a whopping 64% below its all-time high! Its potential is enormous. But it’s beyond just the fact that precious metals are undervalued. Since they are the ultimate safe haven assets, gold and silver will be the direct beneficiaries when other major asset bubbles pop. We have all that now! And I’m sure you could add to the list. What’s frightening is that all these things could occur simultaneously. 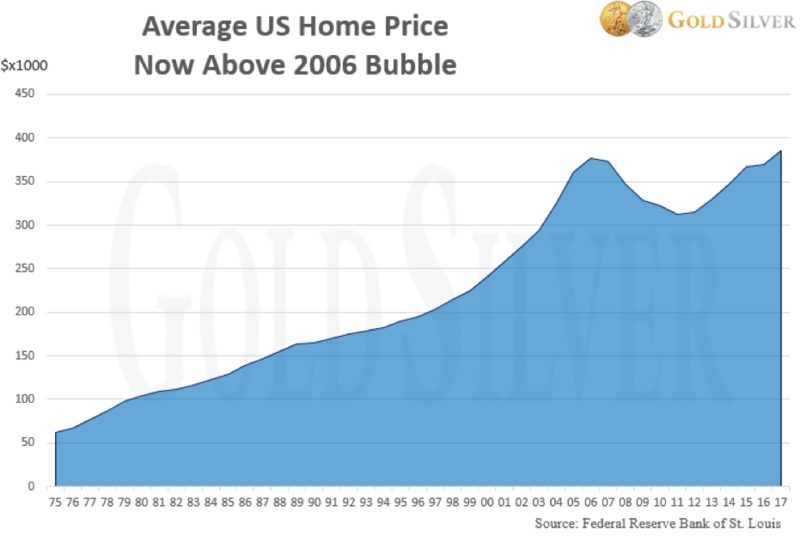 This adds to the likelihood of gold and silver becoming the next great asset bubbles. Investors that don’t own a meaningful amount of physical gold and silver now are taking a huge risk. 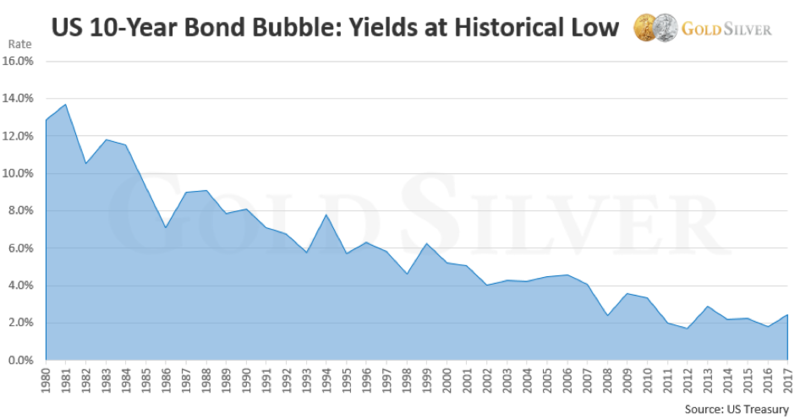 Precious metals will be one of few assets that will survive the bursting of multiple asset bubbles. Gold and silver prices have bounced off their bear market lows, but these gains are miniscule compared to how much they’ll rise in the next gold rush. • Of all major asset classes, gold and silver represent the only opportunity to buy low. They will be a direct beneficiary when other bubbles burst. They will be the next great asset bubble. I hope you’ll join us and buy physical gold and physical silver now, while prices are still low. We pointed out in this article that the best time to buy gold and silver in 2017 was in 2016, but you can see by the charts that other than January, early April has traditionally offered one of the low price points of the year. We didn’t get much of the pullback typically seen in March, but keep your finger on the Buy button, as we’re due. What Happens to Gold and Silver When the Stock Market Crashes? 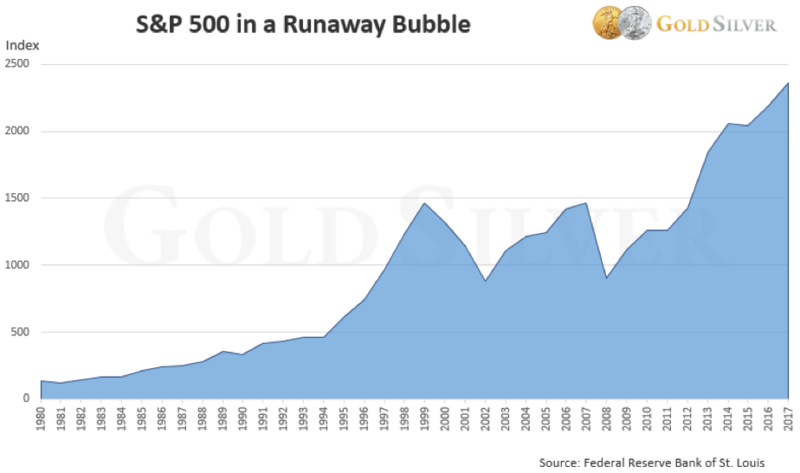 In keeping with this month’s theme, the GoldSilver staff passed around this article that details just how bubbly the stock market has become. 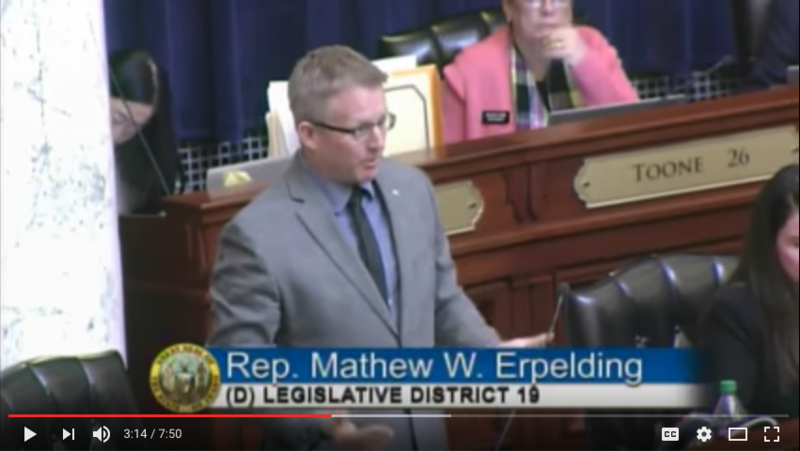 Mr. Erpelding’s “facts” disprove his own point! Here’s the real facts about gold and inflation: the CPI has risen 610% since gold backing was removed in 1968. Since then, when gold was fixed at $35/ounce, the price is up 3,477%, almost six times the inflation rate! This historical fact shows that over long periods of time, gold doesn’t just maintain your purchasing power, it outperforms it. By the way, this article is a good one to forward to any friends and family you’re trying to convince to buy gold.